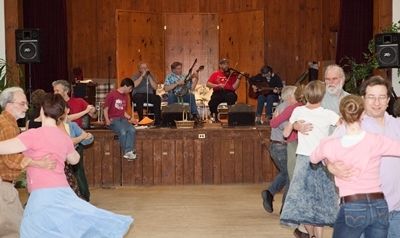 Contra dancing is a traditional form of New England social dance which started back in Colonial times. Often done in a barn in the country, it is also Imown as Barn dancing or Country dancing. The name “Contra” comes from the French meaning “opposite”, as the dancers start the dance facing their partners who are opposite them. Envision the old Virginia Reel—that’s a well-known Contra Dance! Related to English and Scottish country dance, it evolved into the American square dance over the years. It’s a great way to have fun, meet people and get some aerobic exercise. Contra dancing has a caller who prompts the dancers to “do-si-do”, “swing your partner”, and other dance steps. The caller guides the dancers through a sequence of figures that causes them to progress up or down the line, meeting other couples with whom they repeat the sequence. Eventually every couple dances with every other couple. That’s what makes it a real community dance. music is performed live, mainly Irish, New England, and Quebecois jigs and reels. There’s usually a waltz and a Scandinavian couples dance at the break time. Bands feature a variety of musical instruments, but typically some combination of fiddle, guitar, piano, banjo, and mandolin. Light refreshments are provided at the break, and good drinking water is always available. Dances are smoke and alcohol free. No Experience Necessary: Newcomers are welcomed. The dances are fun and easy to learn. If you can walk, you can contra dance. The caller hosts a free workshop 15-30 minutes before the dance to get beginners started. Dress: Dress is very casual. Wear cool comfortable clothing. Contra dancing is aerobic exercise so be prepared to work up a sweat, and have a cool drink. Shoes: Wear clean, soft-soled comfortable shoes when dancing. It’s best to bring a clean pair of shoes to dance in so the grit in the soles of your street shoes won’t mar the fine wooden dance floor. No Partner Needed: Contra dancers are of all ages. Come alone, or with a friend. You’ll meet a lot of new people. The convention is to switch partners for each new set, and newcomers are encouraged to dance with a more experienced partner. This helps you master contra dancing in the fastest, most enjoyable way. Contra dancers are very helpful and friendly. All Dances Taught: The caller walks everyone slowly through the moves of the dance before the music starts. Once the music begins, moves are prompted until no more prompting is needed. As dancers become familiar with the dance pattern, the band can speed up the tunes. The caller usually starts the evening with more common easy dances, so newcomers should come for the beginners’ workshop and get right onto the floor. The caller will judge when dance patterns can become more difficult later in the evening, according to the experience level of the dancers. Become Involved: Contra dance is a community dance run by volunteers. Many people enjoy becoming more involved by volunteering to work with the group helping out with the many small tasks needed to make a contra dance happen. *Adapted from the "contras" brochure.